A very common task when writing a program is to get a list of files or folders and either display it for the user to choose one, or go through each file or folder and perform some action. This lesson shows some simple methods of listing and sorting files and gives some hints on the relevant LiveCode commands used. 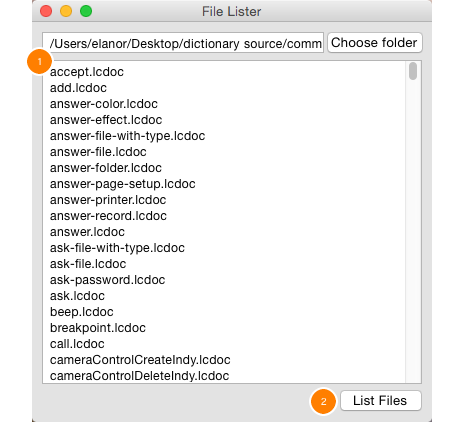 LiveCode has a very simple way of obtaining lists of files and folders on a computer. 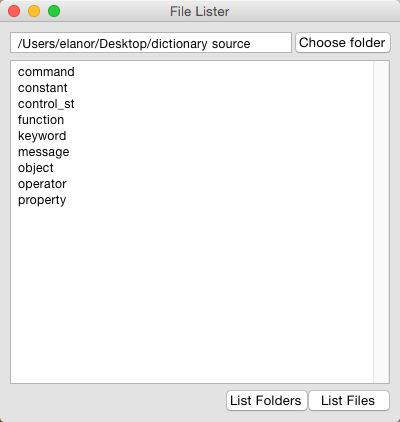 The two functions files and folders and the property the defaultFolder are the only things you need. The basic idea is to set the defaultFolder to the folder you want to work with, and then use the two above-mentioned functions to return the lists of files or folders. We will create a stack that allows us to select the folder we want to work with and displays the files and folders in that folder. 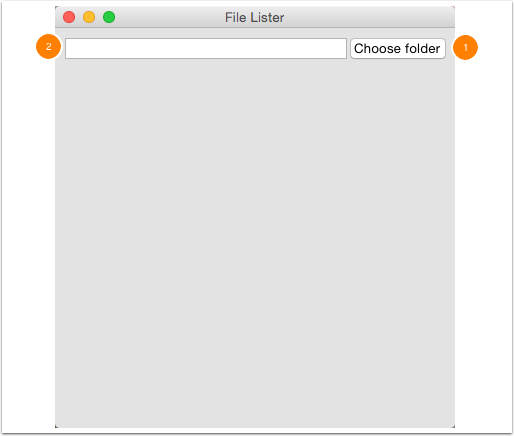 Firstly add a field and a button to the new stack, which we will name File Lister. answer folder "Please choose the folder you want to work with"
put tFolder into field "Folder"
Now we will add a scrolling field called "List"(1) and a "List files" button(2) to our stack. put the files into field "List"
put the folders into field "list"
On many file systems the folders "." and ".." refer to the current folder and the parent folder respectively. It is important to make sure that these two values do not appear in the list of folders or files because they are not real folders and more importantly as you can see later, they can cause problems in your program. A good way to safeguard yourself from this is to use the following functions instead of using the files or the folders. We add these functions to our stack script and change our buttons to call these functions. put filteredFiles() into field "List"
Sometimes it will be useful to know the full path to a file, lets add another function to our stack script which will display the full path to each file in the "List" field. Again we will add a button to the stack that calls the handler on the card script. Performing an action for each file in a folder is a common task. This handler will loop through each file in a folder and call the doSomething handler for each file, giving the handler the name of the file. In the next lesson we will look at using recursion to perform similar tasks to those above but including subfolders and their files. I have created a stack that includes two text files. The stack works perfectly on my computer. When I deploy into a "stand alone" application it works perfectly on my computer. But when I put the stand alone application onto my husband's computer, the text files are missing. When I share the LiveCode app with another computer, do I have to copy the whole folder? Surely the stand alone LiveCode app should have the files contained within it? When deploying for sharing, or sale, people only download the LiveCode file. I would appreciate if you could help me with this as I have been struggling with it for weeks. Note: I am currently deploying to Windows, and hope to deploy to Android later. With a Windows standalone the .exe file does not include any supporting files, you need to distribute these with the executable either by zipping up the whole folder or by creating an installer. When you get to deploying to Android the supporting files will be included in the .apk file created by the standalone builder so you won't need to worry about it for Android. That does answer my questions as to what to expect from LiveCode. I am trying to do something very simple. I have a text file called "Answers". What I would like to do is put this file into a variable so that I can access the data from anywhere in my stack. put tAnswers into field "Field"
I just get tAnswers in my field instead of the contents of the variable tAnswers. Could you tell me how I can set up the variable on preOpenCard, so that I can access it from anywhere in my stack? this has to do with the scope of the variable "tAnswers". You need to declare where the variable "tAnswers" is to be used. Have a look at the entries for commands "local" and "global" in the LiveCode dictionary. filter workText without " "
//filter workText without "" command instead? I am not exactly sure what you are trying to achieve here. More information about the kind of data you are processing would be useful. Are you only interested in single spaces or do you have to take account of multiple spaces, tabs and possibly returns? "fIlter" can be used to remove lines that match a particular pattern. If you are trying to remove white space from a text buffer in memory then also have a look at "replace" or "replaceText". I am trying to write a small app to move files into separate folders according to their extensions, to clean up my download folder once a day. I have found revCopyFile as well as revMoveFolder but cannot find a move file command. I do not want to make copies of my files, but just move the files to individual folders. you can use the "rename" command to move files from one directory into another. Do you know if anybody ever created a list of uses and which commands cover them? The dictionary lists a command and what it does, but I have not found a list that reverses that, so that you can search by what you need and it will list the command for it. 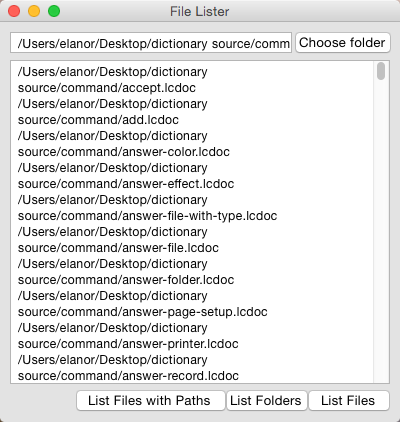 When I search for move or file, the dictionary does not list the rename command, but when I know of the rename command and search for it, the dictionary lists it for me with all its uses. great you got it working. With regards to your suggestion of creating a list of references to a particular functionality in the database. It would be great to have this and we have thought about this and even considered how such a relational system would operate, but unfortunately we have not yet scheduled time to implement this kind of feature. So, even though it would be great to make this available, I cannot give you any idea if or when it would be implemented. How wuld you then go about sorting the list by date created or similar? as a start, try using "put the detailed folders into field", rather than "put the folders into field". You can then filter and sort on the additional information that is provided. Have a look at "sort" in the LiveCode dictionary.